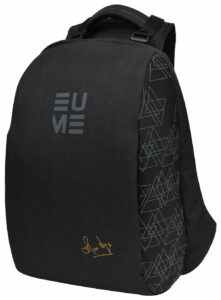 EUME has launched a first of its kind built – in massager backpack to revolutionize the luggage segment in India. With a path – breaking concept and stunning design, the brand has married style with functionality thus posing as an indispensable asset in the urban jungles. The bags have been devised to alleviate pain, rejuvenate and relax the back and shoulder muscles. With its innovative technology, the backpacks are set to be a game changer in the travel gear category. Taking pride in adding immeasurable value into people’s lives, EUME backpacks are ideal for commute and save you from incessant body aches caused by carrying a load on your shoulder. Forged from the finest, most cutting edge materials and fabrics commercially available, they are highly durable, and designed to withstand the everyday stresses of urban life, as well as adverse weather conditions. The backpacks can be touted as an indispensable accessory for the urban, always-on-the-go generation. It also comprises of an in-built portable USB charger for all your mobile devices, as well as specially engineered anti-theft zippers. With patent pending in India and USA, the bag has a simple, organised, and ergonomically designed interior, which makes finding what you need quick and hassle free. The brand is being endorsed by ace cricketer and youth icon, Hardik Pandya. Widely recognized as an all rounder across the globe, his association with EUME is in direct congruence with the features of the backpack. It is urban, contemporary, stylish, comfortable and wellness – friendly. Helmed by 2nd generation entrepreneurs Sanjay and Naina Parekh, EUME enjoys a legacy of over 49 years of trust, user happiness and value for money, drawing upon the family’s business of quality lifestyle products. The idea for the massager backpack came out of a conversation between Naina and her son, about the need for shoulder bags that would help carry heavy weight, while not straining the back. Taking forward the founding vision of the parent company, EUME is growing into a travel essential brand of backpacks and suitcases which are urban in look and feel, desi in cost effectiveness, and global in quality standards. Supported by intensive research with inputs from spine doctors, chiropractors, and fitness experts, the backpack is crafted using only the finest handpicked materials by master craftsmen of the trade. While Naina Parekh is the chief visionary behind the world’s first massager backpack by EUME, brand-master by profession, Sanjay Parekh’s penchant for innovation and drive for perfection led him to create EUME, giving shape to his wife Naina’s idea. So with an indispensable companion and a trusted friend as this, get set to conquer the world!